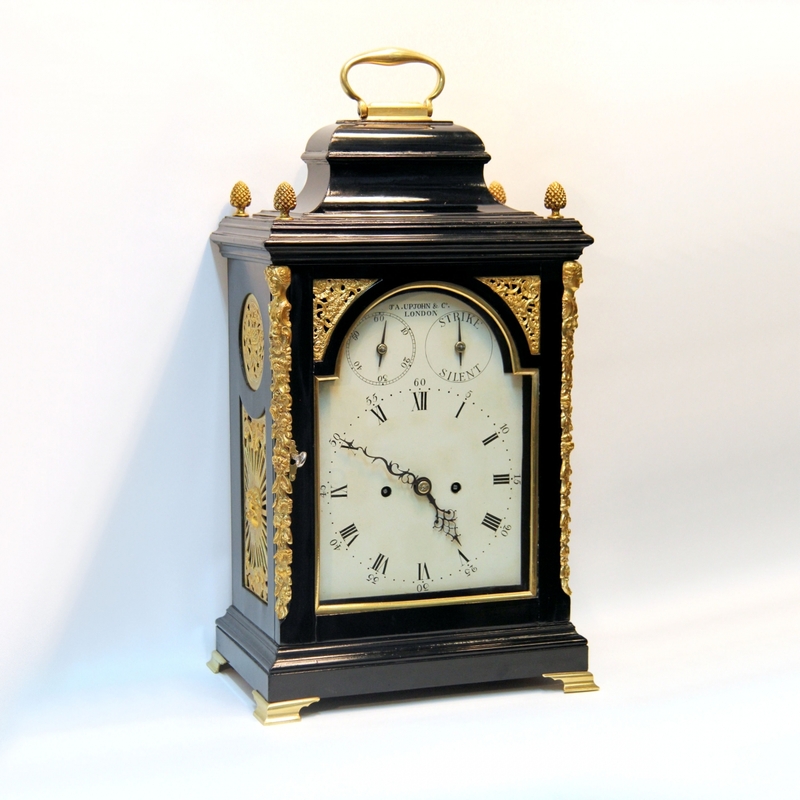 Rare Georgian bracket clock with silent escapement by Upjohn. 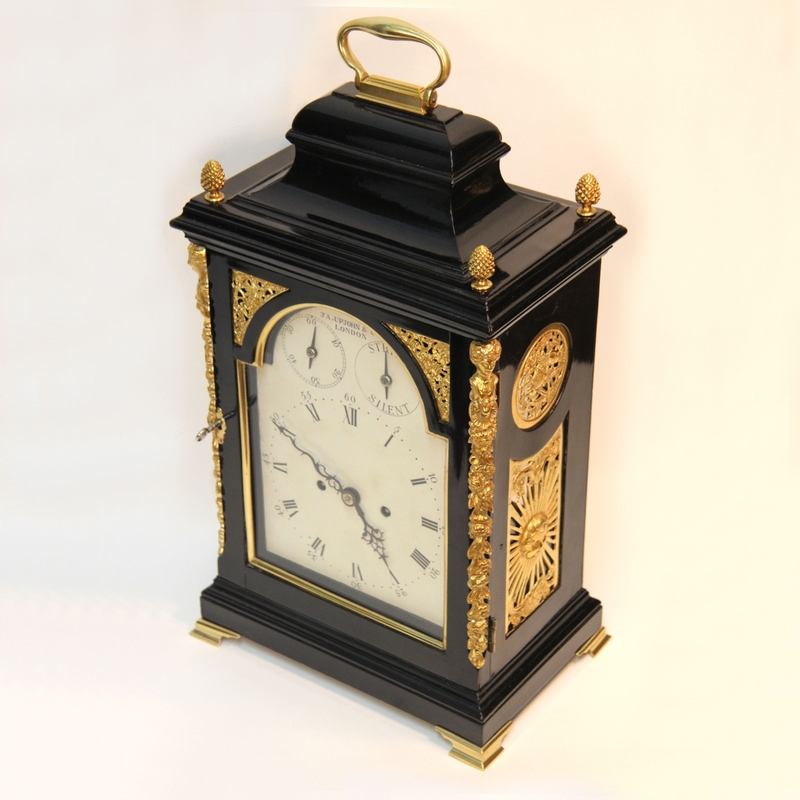 A very rare table clock in an ebonised, bell top case. The eight day duration, 5 knopped pillar, double gut fusee movement with a rare 'Silent Verge' escapement. 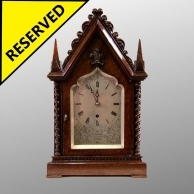 Also, detached pendulum, rise and fall regulation, strike/silent, pull hourly repeat, pendulum locking bracket and rack striking the hours and halfs on a bell. 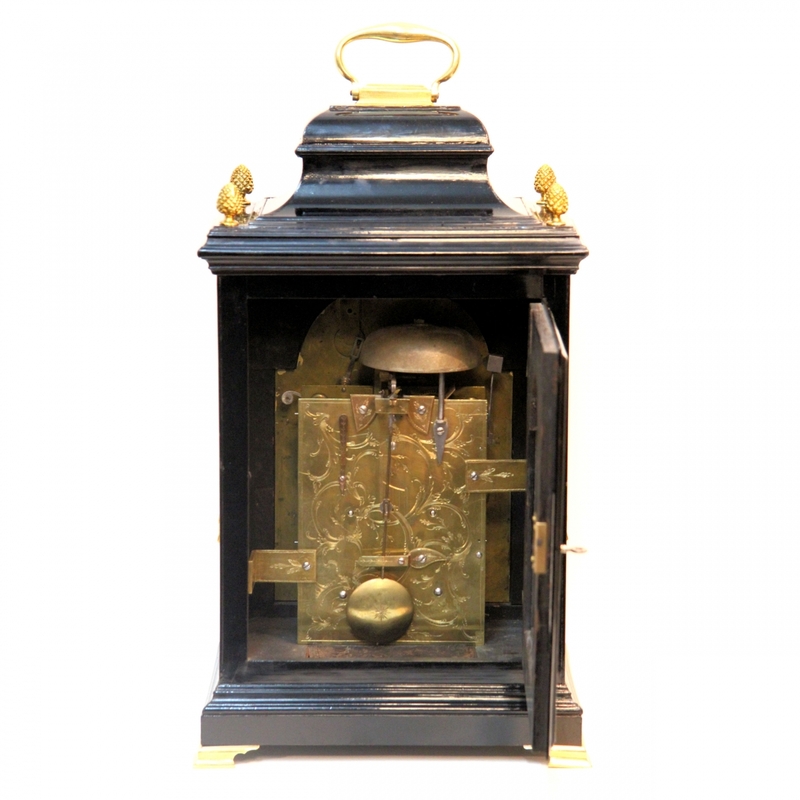 The backplate, fixing brackets, pendulum lock and silent return spring all engraved with a floral Rococo style design and the lenticular pendulum bob having a star design to its centre. 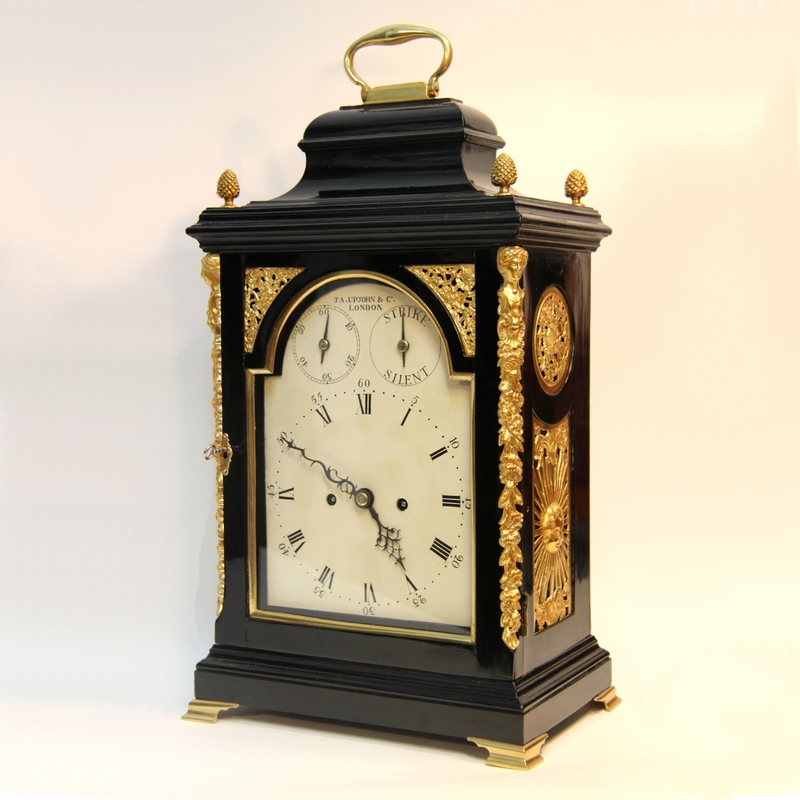 Behind a 7 inch wide, painted brass break-arch dial with its original background paint and having black Roman numerals, minute dots and small, outer, Arabic 5's. The arch having rise and fall regulation and STRIKE/SILENT subsidiary dials either side of the maker's signature of "J.A. UPJOHN & CO. LONDON". Having blued steel setting hands and serpentine style main hands. 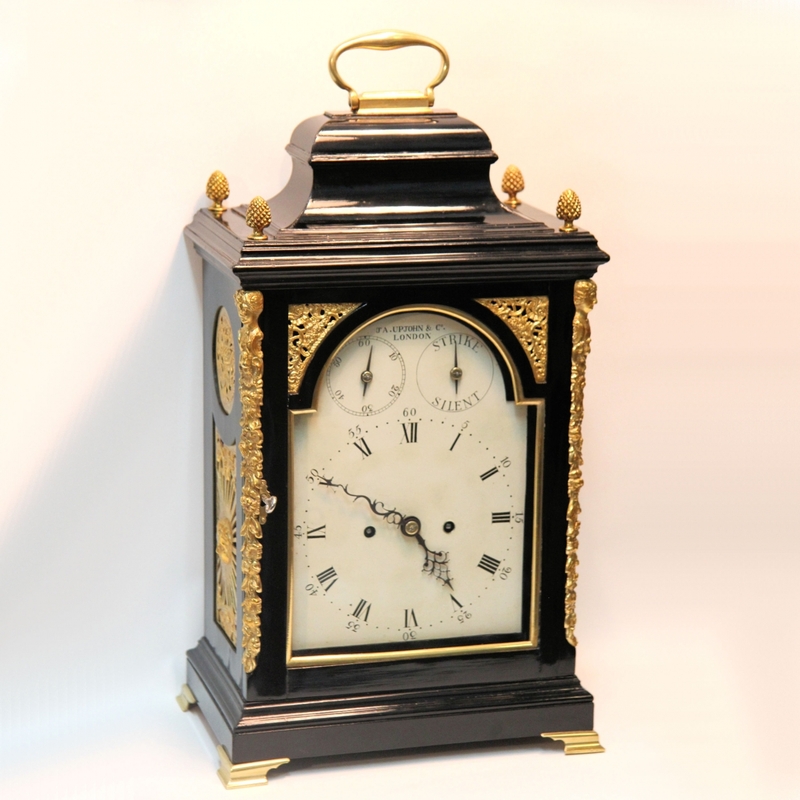 Contained in and ebonised oak bell-top case with gilt lacquered brass top swinging bow handle, pineapple finials to the four top corners, full-length caryatids to the front door edges, Rococo style spandrel frets to the front door quarters, quarter round inner frame to the door, sunburst side frets beneath conforming circular frets and four splayed Ogee feet. 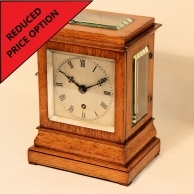 * The rarity and originality of this table clock makes it highly collectable. 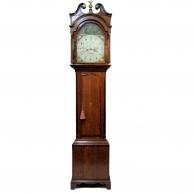 It has an early 'white dial' which was designed for clarity and pre-dates coloured ornamentation. 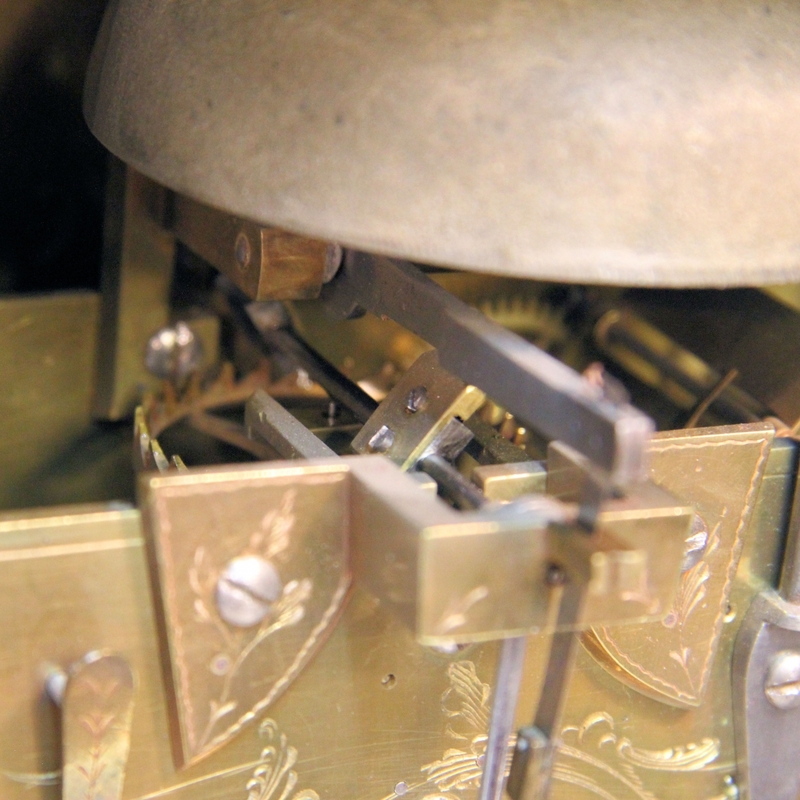 The 'silent Verge' escapement is of particular interest and only the second one that I have ever come across. 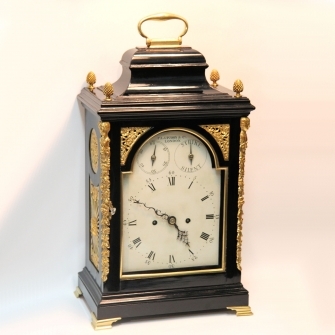 These clocks were often taken to bed with the owner and this is the main reason for the retention of the Verge escapement rather than the more accurate Anchor Recoil escapement; the Verge was much more robust and if carried carefully, could be kept running whilst carried so that no time would be 'lost'. 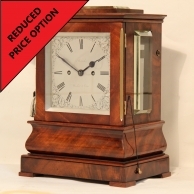 Once in the bedroom the striking would be placed in 'SILENT' mode so not as to wake the sleeper every hour but, should the time be required in the dead of night, the pull cord could be used and the last hour would be sounded on the bell. 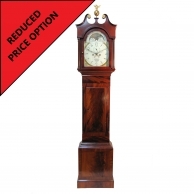 Though soporific, the ticking of these clocks would prevent some owners from sleeping so a solution was needed. 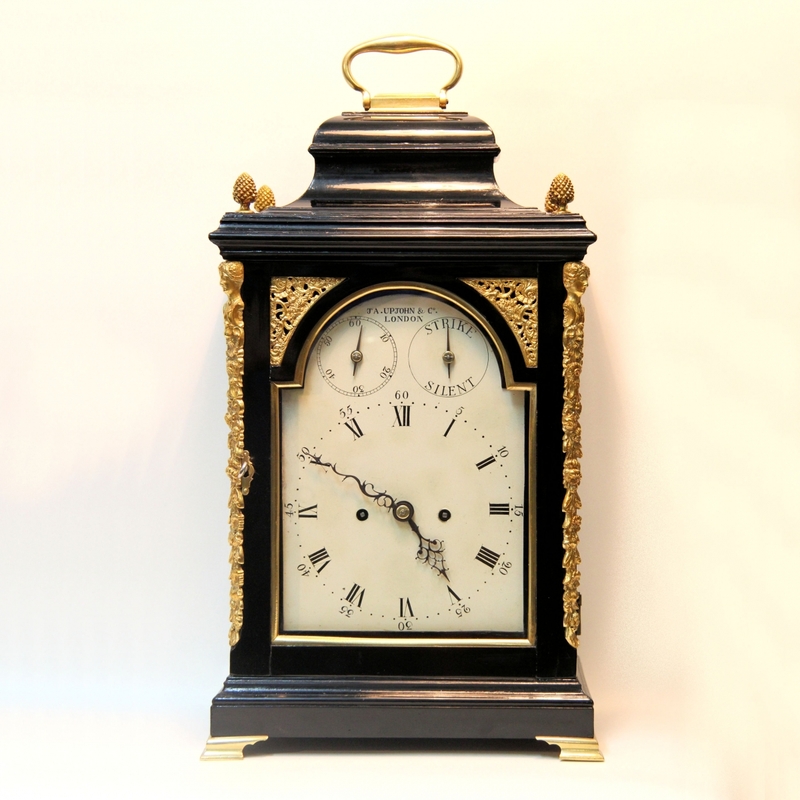 The solution was to make the ticking as quiet as possible by developing a silent escapement which this clock has, the ticking of this clock is barely audible. 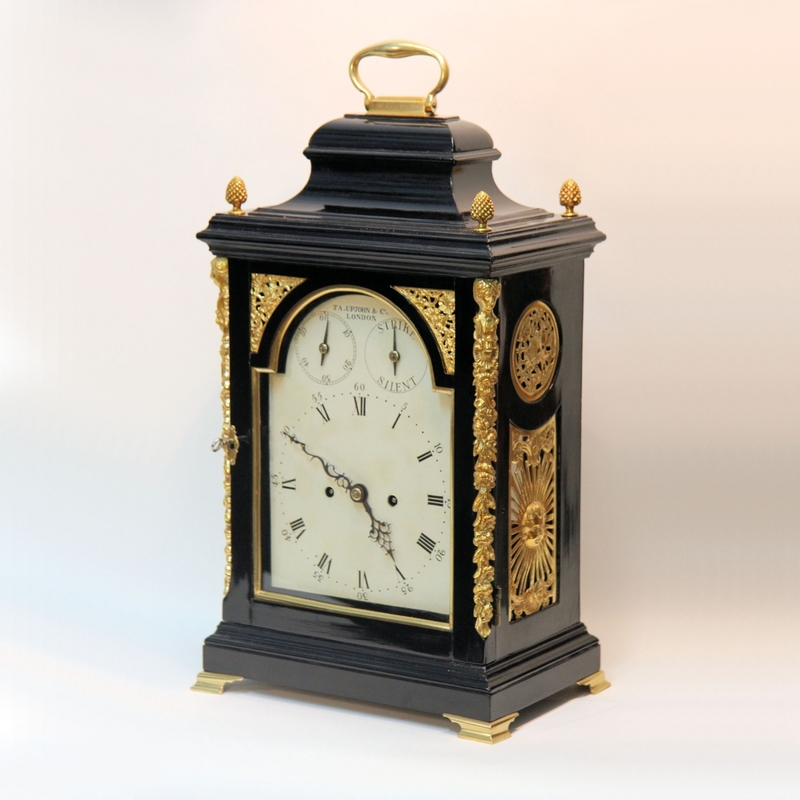 ** James Upjohn was part of a clockmaking dynasty which was well respected for producing good clocks. James began in Threadneedle Street and moved to Lombard Street in 1765, he was also at Red Lion Street. He was in partnership with his eldest son Francis until 1773. He then gave up a branch to his son and continued as J. Upjohn & Co. in Red Lion Street. Dimensions: 20 1/2" high including handle x 11" wide x 7 1/2" deep. Condition: Excellent (awaiting movement overhaul).